Yesterday I wrote about 850 words. I had another nice long stretch on my commute home. That's still not a ton of words for a day but it is about 350 more words than Day 1. I have chapter 21 finished and most of chapter 22. I'm not writing a ton of words, but so far I have managed to write every day and I'm really happy about that. When I finish the 25th chapter of the novel I will be halfway done with it. Wouldn't it be cool if I could finish my novel this month? That is my goal. With that said, I should probably figure out what my word count for each day needs to be and try and hit that. I have 28 days left in the month and about 28 chapters so I would have to write a chapter a day. I try to shoot for 1,000-word chapters but they usually end up being a little more than that. I think I will do that. One chapter a day, but I'm still not going to beat myself up for days with only a couple hundred words. Even if I only write a little bit, but do it every day, I'll still have more words at the end of the week. Two days in a row isn't much of a streak, but it's a great place to start! 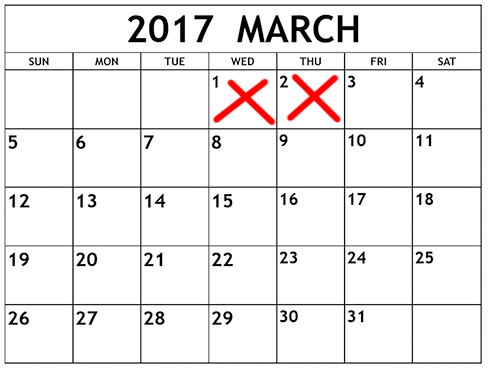 I can't wait to see this calendar full of red xs. I will be super bummed if there is even one day that ends up blank. My goal is to not let that happen. Even if you're coming in a couple days late, join me! Start your own calendar and paint it red!